Transparency in Bloomington means City Hall decides what they want you to see, then they celebrate posting documents they claim you want to see. Mayor Renner has an agenda from which he plans to take no detours. He doesn’t care what you think and he doesn’t like being challenged. Many of the Council members are the same. These elected officials have a public persona and a very different one in private. Bloomington has denied access to many emails requested by me under the Freedom of Information Act. 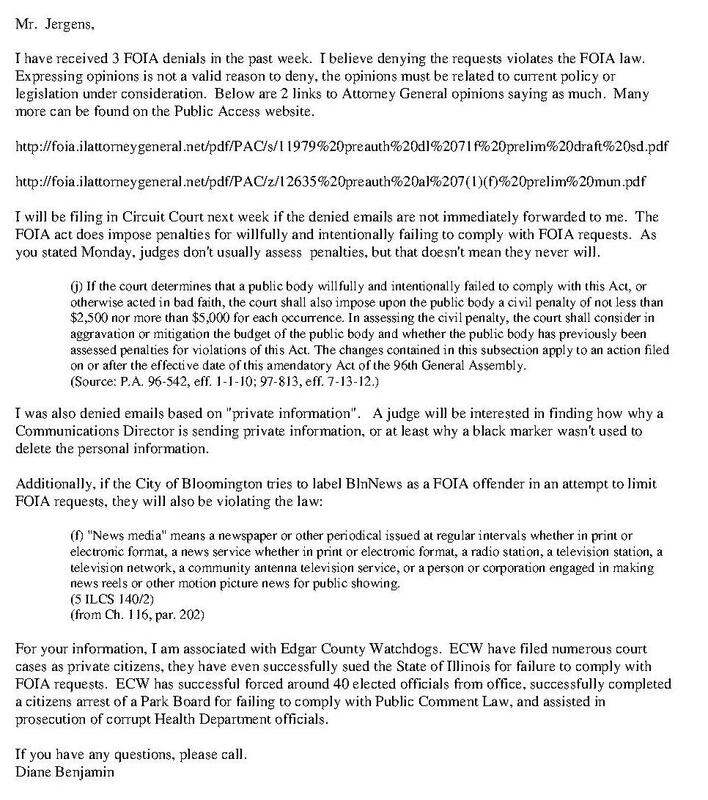 In the past I have filed a Request for Review with Attorney General Lisa Madigan’s Public Access Office when I am confident the emails were illegally denied . Filing with Lisa Madigan has turned into a joke. Instead of protecting citizens, it can take months or years for them to conclude even the easiest investigation. Justice delayed isn’t justice. This email needs one correction. The Edgar County Watchdogs are up to 70 elected officials removed from office. Laws matter. In Illinois they are bent and broken repeatedly by elected officials. Nothing in Illinois will ever change unless local officials are held to the law. Since the local media doesn’t do it’s job, its people like me that must. Posted in BloNo, Bloomington, Local, Pantagraph.Tagged Fazzini, FOIA law, Renner, transparency. Thank you and the ECW and for standing up to the crooked politicians! You are doing a fantastic job! We need more people like you. Cool, I am sitting on the edge of my seat! Keep it up. It makes me want to get involved. Good. That is what is needed. A donation to help me cover costs would be nice! Then contact the Mayor and aldermen! Previous Post Still afraid of Rauner? Read this!